Brainstorming is an important part of any meeting. If you want to get off on the right foot, you need to first consider all of the possibilities that you can in order to leave no stone unturned. 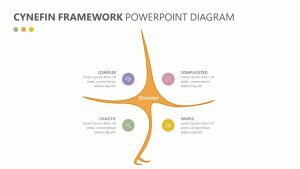 The Mind Map PowerPoint Diagrams allow you to do that in a number of different ways. 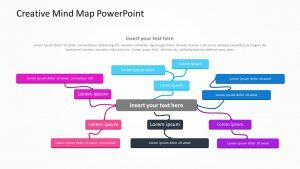 This PowerPoint slide collection is completely customizable and makes it so that you are able to make it perfectly unique to your company or your project. 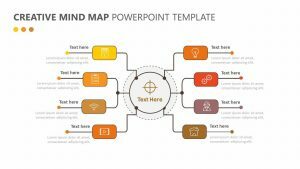 The Mind Map PowerPoint Diagrams comes with a number of different slides that you can use to brainstorm upon different parts of the project. The first slide includes a central circle in which you can add in the main talking point. 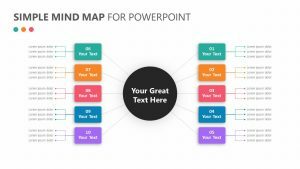 There are five main veins that come off of the main circle and are color coded for you to branch off into brainstorming ideas for each one, all of which add up to a main whole. The second slide offers rectangles that are a bit more organized. The biggest rectangle is in the center and provides a starting point for the rest of the thoughts to center around. It has less prominent features so that the idea becomes to generate thoughts about one central point. 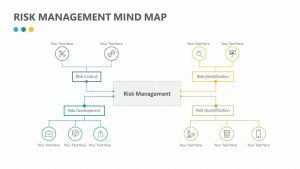 The third slide allows you to discuss the four main points and elaborate on the smaller details of each one out to the side. The final two offer different circles that allow you to brainstorm answers to questions that need answers.